Developed for precision long range shooting to 3000m, this scope mount system provides a large range of elevation adjustment, 0-60 MIL & 200 MOA models, with repeatability and durability for field use on large magnums 338LM, 375CT, 408CT, 416B and similar ELR cartridges. Project One, LLC is a small design and manufacturing company specializing in the development of precision long range shooting equipment and gear. The Ivey Shooting products being produced now were started by Stephen Ivey in 1999 with the original compact adjustable scope ring design to satisfy long range shooter’s need for more elevation than most high power scopes could provide. Project One, LLC was started in 2005 by Stephen and began producing the Ivey Adjustable Scope Mount.. It has been greatly improved since then from continuous testing, upgrading materials, machining methods, and design features. 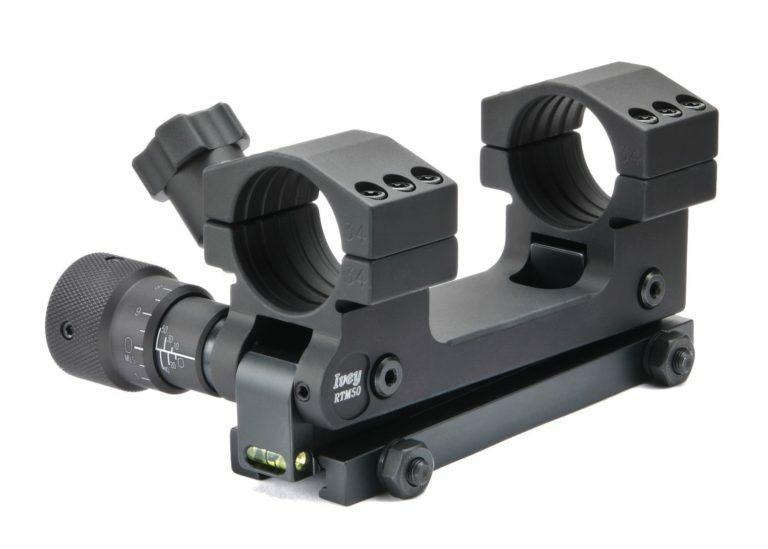 Much of these great design improvements have come from our customer’s experiences and applications that have evolved our product into what we feel is a very solid adjustable scope mount. We take great pride in providing this very necessary piece of equipment to our customers who are pushing the limits of long range shooting. Graduations: 5.0 MOA clicks / Rotation index marked 0-50moa, with half unit hashmarks. 1 Milradian = 100mm of correction at 100m range. 2 Height measured from the top of the primary base rail to the center of scope ring diameter. 1 MOA = 1.047" of correction at 100YDS range. Internal scope turrets typically are not intended to be adjusted repeatably to the extents of their adjustment range as needed in extreme ranges and may cause premature failure if full-cycled often. Using the external adjustment mechanisms will keep rectifier tube centered in scope for best optical picture and will reserve turrets for only fine position tuning. 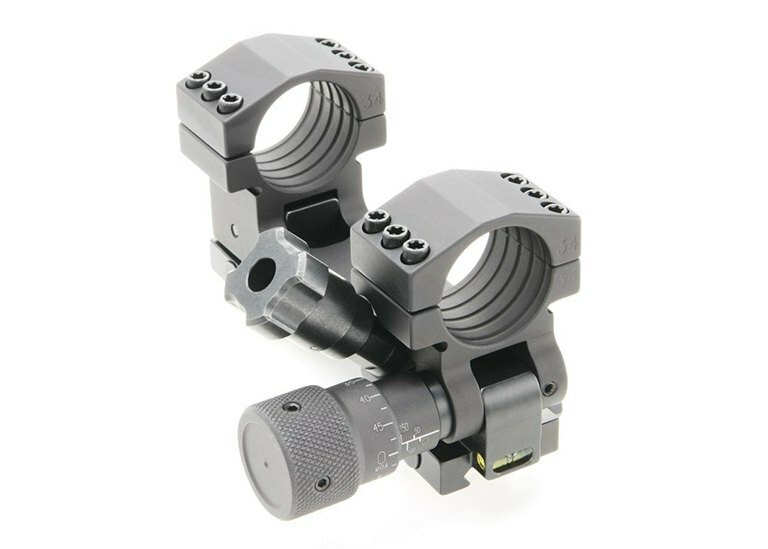 The Adjustable Scope Mount system provides elevation adjustment by pivoting the integral scope ring platform to allow a rising bullet path from the bore. The rings have a tight fit wrist pin connection to sub-bases that in turn directly bolt to a rifle's mounting 1913 Mil Std (Picatinny) rail. The front ring and sub-base joint allows natural rotation about the front connection while the rear is guided up and down along an arcing track without imparting any stress to the scope tube. The adjustment knob is graduated to read down to 1.0 MIL (5 MOA) & 0.5 MIL (2.5 MOA) clicks for repeatable settings. Adjustment requires no tools and can be done using off hand while keeping right hand in place on trigger grip. Reference 1.0 MIL = 100mm @ 100m = 3.438 MOA est. No sales tax added for orders outside the state of Tennessee. 9.750% sales tax is added to orders within the state of Tennessee. 2) Special pricing for military, police, and dealers available upon request. 3) UPS Ground shipping within the CONTINENTAL USA ONLY. Dealers available upon request for international customers.